With The Long Walk Stephen King has one of his best ideas yet. Some sort of future or present day military authority has organized The Long Walk. It is a kind of game show, kind of draft. Any number of people can sign up, but only 200 are chosen. 100 walkers, 100 alternates in case people back out before the final back out date. After that the field is set. 100 walkers. They start in northern Maine and walk until only one person is left. Seems simple, and it is, but there is more. See, for 99 of the 100 walkers The Long Walk is a death sentence. The winner is the one who survives, but the rules are simple. If a walker slows to less than 4 miles per hour he is given a warning. A walker can be given three warnings. The fourth time he is out of the walk. By "out of the walk" I mean that he is shot where he stands. A walker can earn back warnings by going an hour between warnings. There are no breaks, no rest. No sleep. Need to use the restroom? Better go while you walk. Why walk? Well, King reveals that as the novel progresses. We meet quite a few of the walkers and get some of their stories but the focus is on Ray Garraty, a teenaged boy who joined the Walk. 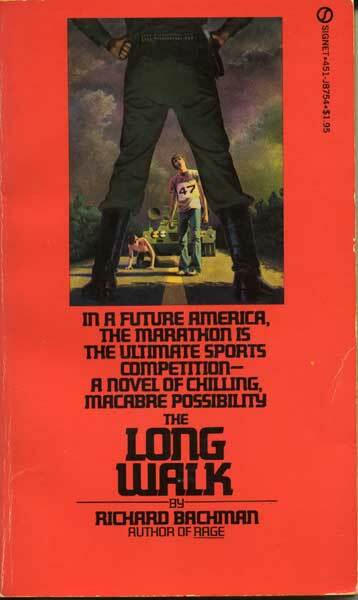 The Long Walk was written when King was a freshman in college, but published several years after Carrie under the Richard Bachman pseudonym. It is easily the best of the four early Bachman novels. Multiple meanings can be read into The Long Walk. It could be viewed as a discussion on the draft where even though in the Walk the characters choose, they are typically young men or boys with no real concept of what they are doing and when they are selected in the lottery for the Walk, they are dead men walking. It could be viewed as a shot across the bow of America's view on death and entertainment. It is a telling of Shirley Jackson's The Lottery, but as on crack. A general examination of young men and death and why someone would get into The Walk. The scary thing is that if somehow The Walk was legal and some unsavory television producer tried to get the show on the air today...people would sign up knowing they would die. For the chance to be financially set for life and all you have to do is walk farther than the next guy? Teenagers would jump into this without really understanding what they are doing and that is EXACTLY what happens in King’s 1979 novel The Long Walk. It is not horror in what you would imagine the genre to be, but it is horrific. It is not so much a thriller in having a chase and a mystery, but it is thrilling. With each walker who gets his "ticket" on the fourth warning, the risk to Ray and the group he spends most of his timing walking with and talking to is increased. Pete McVries, Art, Stebbins, Barkovitch, Hank. Others. Then there is the specter of The Major looming over the story. There is anger, disgust, exhaustion, tension, death, hope, fear, and perhaps every other emotion and King builds the tension as the novel progresses. Almost thirty years later and The Long Walk holds up well as a simple story with a horrible setting. Yet, we can’t look away. Well worth picking up a copy and giving it a go. thanks for the review :) i've had the book for a while now and i'd been reluctant to read it, since i knew nothing about it (and i was too lazy too google). sounds interesting, i'll pick it up next time i'm in the mood for some king. I read through the Bachman books collection because it was the only way to get Rage in this country, and The Long Walk was easily my favorite novel of the set.